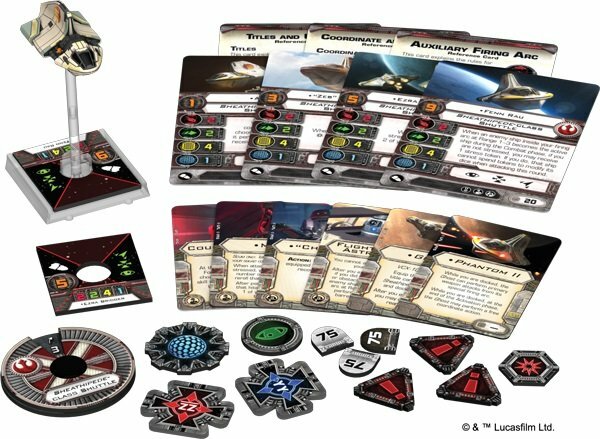 The Rebels are getting some major changes to their action economy with the Phantom II Expansion for X-Wing! In Star Wars, the Rebellion is a rag-tag group of freedom fighters that band together to pull off impossible tasks – from stealing the plans to a highly secretive operation, to blowing up planet destroying super weapons, and toppling an evil galactic empire. At their core, they are a force that is built on teamwork and sacrifice. 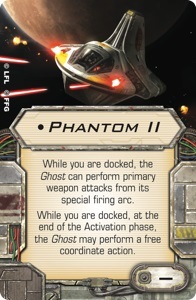 The Phantom II expansion helps to exemplify those ideals in new and exciting ways for X-Wing players. 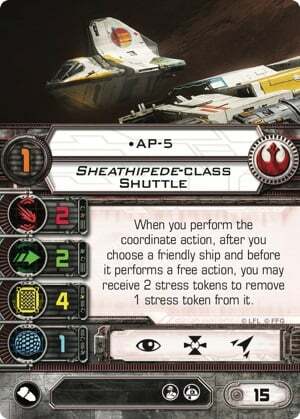 With only two attack, two agility, four hull, and one shield, the shuttle is a subpar fighter, but its coordinate action and its pilots’ unique pilot abilities ensure it will have plenty to offer the rest of your squad. 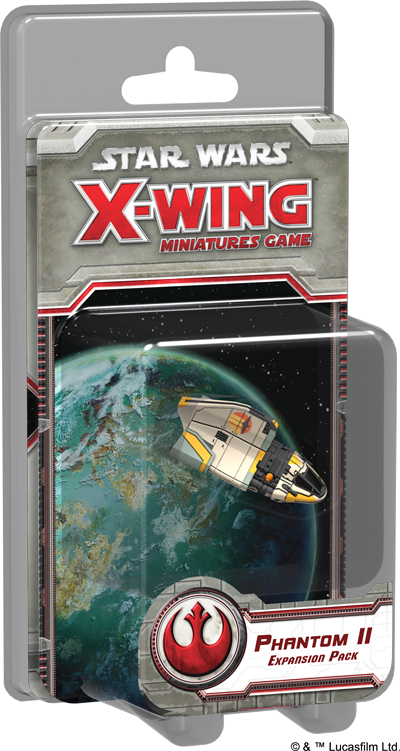 This was first available in Epic play but with the Phantom II, it’s being brought over to standard games of X-Wing. It won’t allow a ship to perform the same action twice but it can free up a ship to pull off some pretty fantastic combos and get some “out-of-sequence” actions. The Phantom II is indeed the replacement/upgrade to the Phantom I. It can also dock with the Ghost or you can run it as a solo ship. AP-5 is a strange pilot. You use this pilot’s ability to strip stress from a friendly ship but at the cost of an extra stress on this ship. However, that’s really not why you want to run this ship – you want to run it because of it’s PS 1. Say What?! Yeah – you want this ship to go first so that you can use your Coordinate action early to block OTHER ships and allow your squadmates to then move after they have been bumped. Now that will depend on your timing – but it could be highly effective. 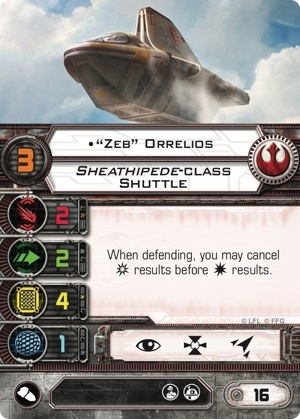 Zeb is back as a shuttle pilot for the Phantom II and he’s allowing you to cancel crits before hits. Hey, for a ship that’s got 1 shield and 4 hull, that could be pretty life saving. At the same time, he’s got a lower PS so you’d want to run him for the same reasons as AP-5. Ezra is also back and he’s got that middle-band PS covered. Going at PS 5 means you’ll outclass lesser pilots, but will be moving before those tricky aces. 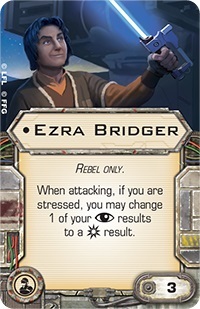 If you’re going to run Ezra, you’re going to have to be able to adapt your play style based on the list your facing. That said, he’s got an EPT and a pretty solid combo with an unlikely ally…more on that below. Fenn Rau shuts it DOWN. 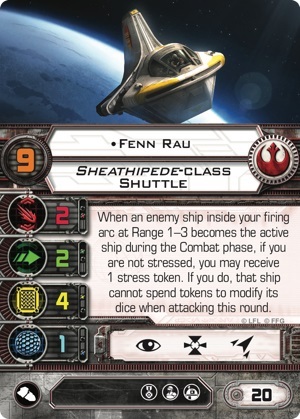 Between having a PS 9 and all the benefits there-in, his ability just flat out shuts down token-heavy ships. This is a really good counter to squads that are using Mindlink to pull of shenanigans. 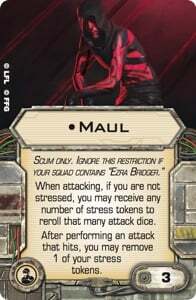 Maul is a Scum only upgrade – so what is he doing in a Rebel pack? Simple – you can ignore this restriction if your squad contains Ezra Bridger! Maul just happens to combo with Ezra extremely well. You can take any number of stress to reroll that many attack dice and after you attack and hit, you may remove that stress. If you have Maul ride shotgun with Ezra, then you’ll get a way to generate stress – and then hopefully dump it on the same turn. 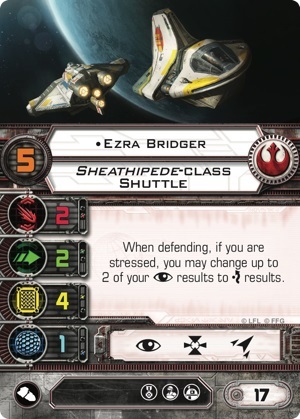 Conversely, you could also run the Ezra crew card in another ship to convert a focus to a crit when stressed. There are a few big ships out there that have room for both Maul and Ezra but either one on their own is an option to consider. “Chopper” is getting a new version and this little guy has some tricks up his sleeves. He’s fairly cheap and give the Rebels yet another way to regen shields. He’s perfect for chucking things you don’t need any more – like say a Title Card that only allows you to dock at the start of the game…but think outside this expansion. Any ship can take Guidance chips and it’s 0 points. That’s an easy free shield to score back, too. There are many, many more candidates to choose from. It’s going to cost you the action for that turn but it could be worth it! 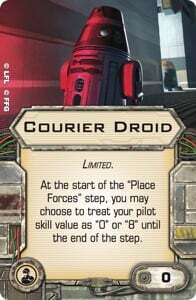 Courier Droid allows you to mess with your deployment by either going at the “0” or “8” step – or your native PS step. 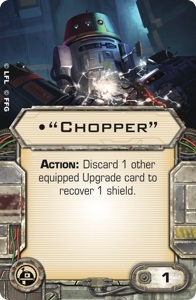 I’ve never been a fan of these types of cards…but at least this one is “0” points and takes up a crew slot. Looks like “Chopper” might be shoving this little guy out of an airlock for an extra shield…Hey – don’t look at me like that! It’s not programed to feel. 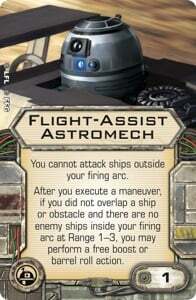 Hey, T-65 X-Wing pilots – you know how you’re always looking for a buff? HERE YOU GO. It’s a single point upgrade and it allows you to get a free Boost of Barrel Roll action. I’m still “sorry, not sorry” about the Biggs nerf so maybe this will put some ice on that burn. But honestly, that’s not a bad deal for a lot of ships! You can’t attack ships outside your firing arc (but you have a fixed arc anyway so no turrets) and you’ll get to access to boost or barrel roll for dirt cheap! C’mon – that’s a solid option if I’ve ever seen one. The Phantom II is up for pre-order now – how will you incorporate it into your squadron?